The presence of Spain's national police or civil guard officers in Catalonia is a highly contentious issue, even more so because of their role in the violent crackdown on the Oct. 1, 2017 secession vote. 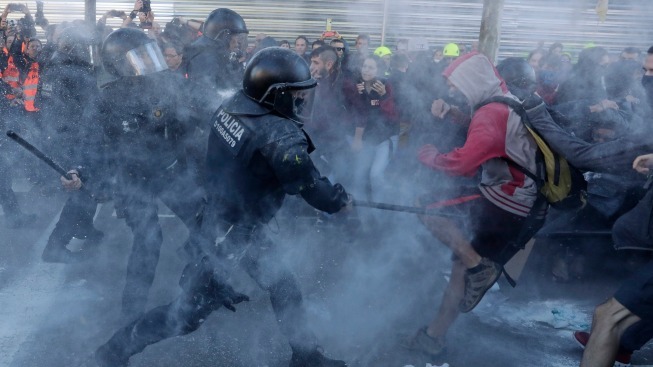 Separatists often called them "invaders"
In this file photo, police charge against protesters during a demonstration by CDR (Committees for the Defense of the Republic) in Barcelona, Spain, Saturday, Nov. 10, 2018. The so called Committees for the Defense of the Republic is a grassroots group that organise protests in Catalonia to press for their demand for independence. Spain's central government is threatening to deploy national police to ensure security in Catalonia if regional authorities fail to stop the recent disruptions by pro-independence protesters on major highways.